The newly launched Alulite® is a simple-to-use and cost-effective radiant barrier, excellent to prevent downward heat flow into buildings during the summer. 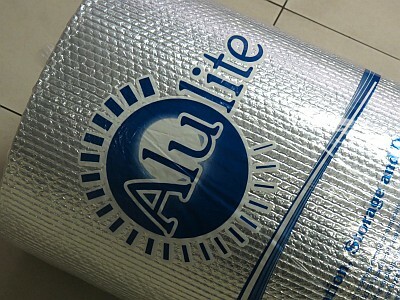 Africa Thermal Insulations (ATI) has launched a new double-sided insulation product called Alulite®, developed specifically for the domestic market. Alulite® is manufactured using a modern, sophisticated, continuous laminating process which creates a layer of low-density polyethylene air cells, laminated on both sides with foil. This makes for an excellent radiant barrier for downward heat flow in the summer and a moderate barrier for upward heat flow in the winter due to the air bubbles. Due to its high reflectivity and low emissivity, less energy is needed for heating and cooling, which in turn results in savings on electricity. Alulite® also prevents heat build-up in the roof space, thereby improving the performance of bulk insulation and protecting the services from cracking and degrading. What’s more, it is easy to install without safety equipment being required, it prevents dust penetration into the attic space and also acts as a waterproof membrane. It is non-toxic, non-carcinogenic and does not attract rodents. Alulite® has been tested by the South African Bureau of Standards (SABS) in accordance with SANS 8301:2010 and has achieved a thermal resistance value of 1,58m²K/W and a thermal conductivity value of 0,063W/m.K. In addition, Alulite® complies to the fire regulation SANS 428. With its manufacturing plant in Krugersdorp and various branches and distributors located all over the country and into Africa, ATI have been extremely successful in providing good service. Caption: Alulite® is a simple-to-use and cost-effective, double-sided radiant barrier, excellent to prevent downward heat flow into buildings during the summer.